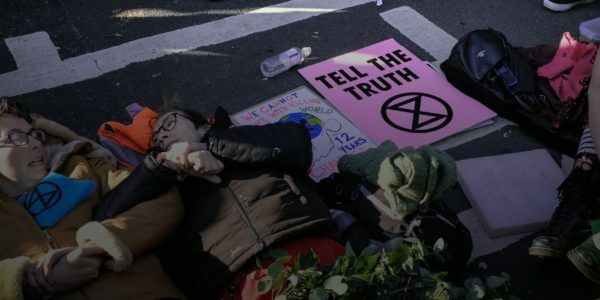 Extinction Rebellion is an international movement that uses non-violent civil disobedience to achieve radical change in order to minimise the risk of human extinction and ecological collapse. On 31st October 2018, we assembled on Parliament Square in London to announce a Declaration of Rebellion against the UK Government. We were expecting a couple of hundred people. Instead, 1500 came to participate in peaceful civil disobedience. The energy was contagious! The next few weeks were a whirlwind. Six thousand of us converged on London to peacefully block five major bridges across the Thames. We planted trees in the middle of Parliament Square, and dug a hole there to bury a coffin representing our future. We super-glued ourselves to the gates of Buckingham Palace as we read a letter to the Queen. Our actions generated huge national and international publicity and, as news spread, our ideas connected with tens of thousands of people around the world. The XR project was resonating with a deeply felt need for community and solidarity. “We are the ones we’ve been waiting for,” we chanted! Dozens of countries now have groups springing up, from the Solomon Islands to Australia, from Spain to South Africa, the US to India. So what’s next? We are working relentlessly, building our movement in preparation for phase two, an international rebellion that will begin on 15th April 2019. So come and join us. Rebel for life. For the planet. For our children’s children’s futures. There is so much work to be done. We aren’t focussed on traditional systems like petitions or writing to our MPs and more likely to take risks (e.g. arrest / jail time). We don’t want or need everyone to get arrested – for some this is not a good idea – but we do want everyone involved to support civil disobedience as a tool. We are promoting mass “above the ground”, or in other words- in full public view, civil disobedience. This means economic disruption- to shake the current political system- and civil disruption- to raise awareness. We are deeply sorry for any inconvenience that this causes. We have made some decisions about security and our interactions with the police. We have made a strategic decision to communicate with the police about what we are doing when we believe that is more likely to enable things to go well (which we can’t always be sure of). Except for the case where a small group is trying to do a specific action that needs the element of surprise, we generally don’t try to be secure in our communications about plans. We expect that we have been infiltrated by those without our best interests at heart and suggest people bear this in mind. We are about political change, not personal change (though we welcome the latter). We are completely nonviolent, our actions are done in full public view and we take responsibility for them. We have an Action Consensus which outlines how we work together on actions. The structure aims to empower anybody to act as part of XR, so long as they agree to follow our ten core principles (see below). You can read our Self-Organising System (or XR Constitution) for more information. We are seeking a balance between being able to act quickly in response to fast-changing situations and being able to integrate the collective wisdom of multiple perspectives when needed. Here is a Visual Representation of the Working Groups that are organising at a UK-wide level, and this constantly evolving spreadsheet contains more information about each of these groups. Mobilising 3.5% of the population to achieve system change - using ideas such as "Momentum-driven organising" to achieve this. We collectively create the structures we need to challenge power. Anyone who follows these core principles and values can take action in the name of Extinction Rebellion.